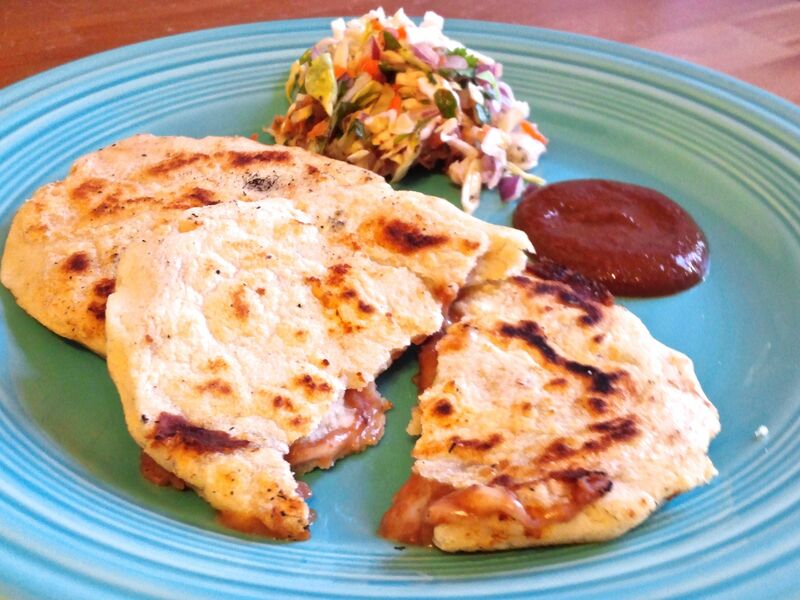 Refried bean and cheese pupusas. 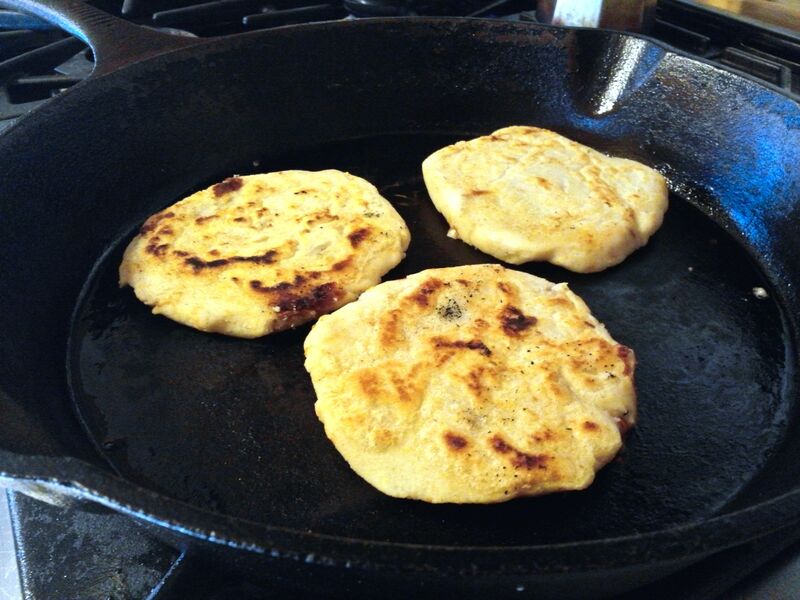 This afternoon we made pupusas, a traditional Salvadorian stuffed, soft tortilla. I was introduced to pupusas a few years ago by an Indian friend, i.e., from India, while I was couch-surfing near Baltimore, Maryland, of all places. He took me to his favorite Salvadorian restaurant, a modest place called Bananitos, where friendly Salvadorian ladies were continually preparing pupusas by hand and other Salvadorian dishes for a stream of customers, many to take away. Roll dough pieces into an approximately golf ball-sized balls (or slightly larger), push each flat, then add a spoonful of filling in the middle, e.g., refried beans mixed with shredded cheese. (We used smoked mozzarella.) Next, wrap the dough around the filling back into a ball and then re-flatten it into a tortilla perhaps 1/4 inch thick. Try to keep the filling contained when pressing, but it’s OK if leaks a bit. 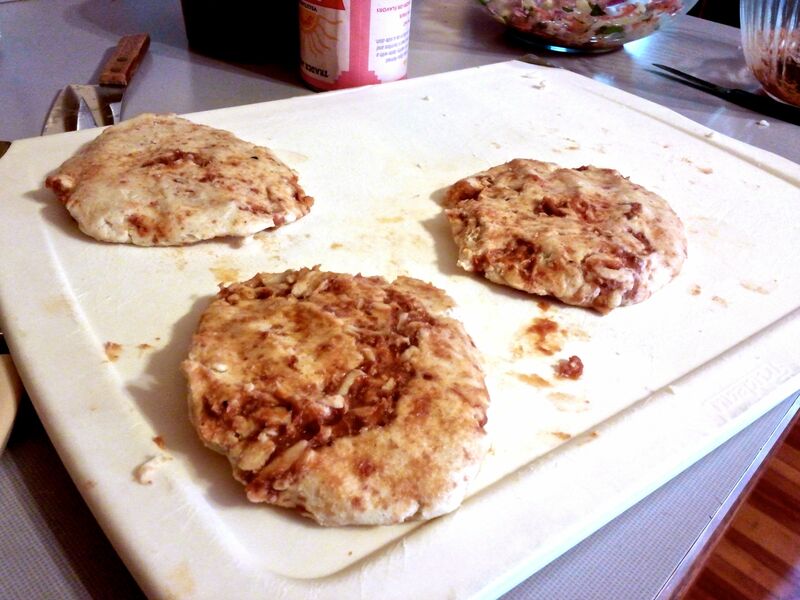 Preparing refried bean and cheese pupusas. Next, simply cook the tortillas a few minutes per side at medium or medium-low heat on an oiled surface, e.g., a cast iron pan, until a bit browned and cooked through. Cooking pupusas in an oiled pan. 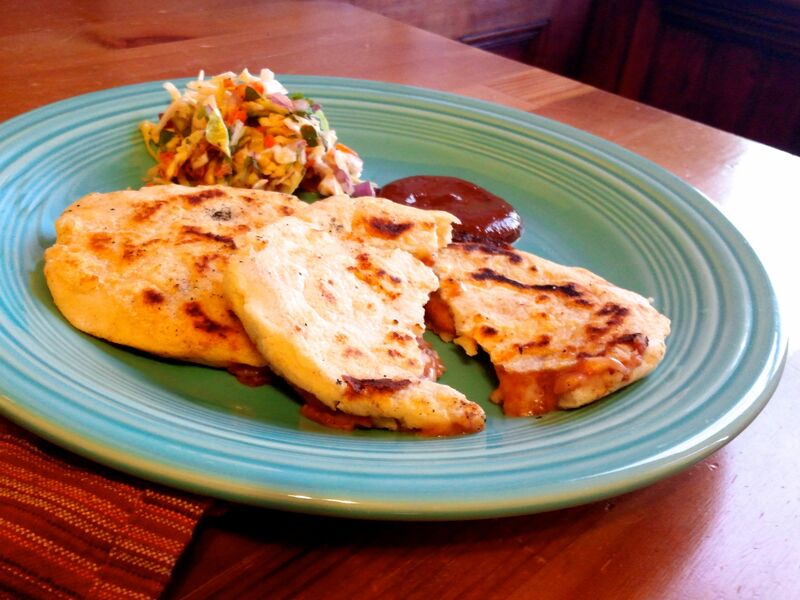 Pupusas are typically served accompanied by a mildly pickled cabbage slaw called curtido and a tomato sauce. We served our pupusas with a green cabbage slaw of the sort one might serve with fish tacos and a mole sauce, left over from last night’s mole chicken. Pupusas served with cabbage slaw and sauce. Pupusas are a wonderful treat from central America that, whenever I see them, I’m reminded of visits with my exuberant Indian friend, a great citizen of the world, with whom I first shared them. I found pupusas fairly forgiving to prepare, being able to add additional water to the dough (that I had originally prepared for dumplings cooked in the mole sauce) until it was possible to work (or rework) them easily into thick tortillas. I hope you give them a try and enjoy them too! Steamed Dumplings with soy and chili garlic sauces. 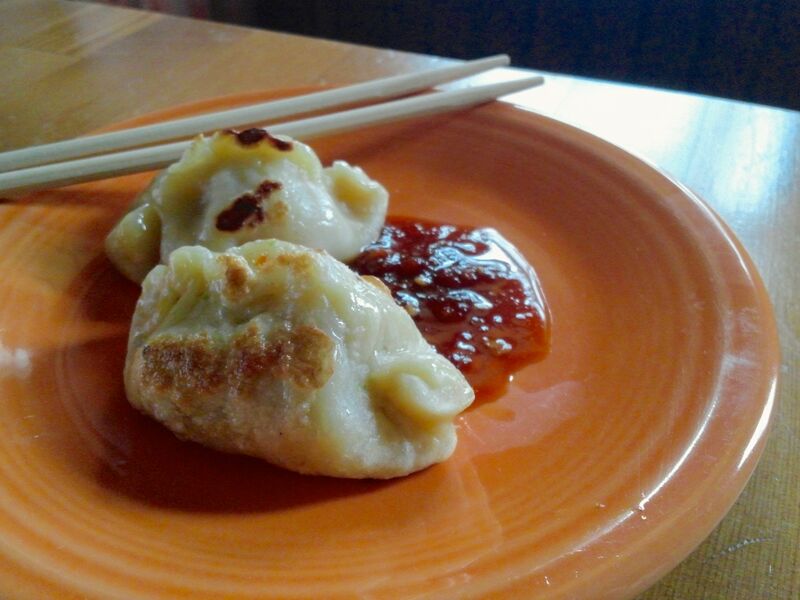 Here is a popular treat from Chinese restaurants that’s fun to prepare at home, especially if you’re interested in an exotic dinner and aren’t short on time; we spent a couple hours making about 30 dumplings. They can be prepared ahead of time and frozen, but I wouldn’t want to miss the pleasure of eating a few right to reward myself right after the prep work! The vegetarian dumplings were filled with a mix of napa cabbage (finely chopped), carrot (grated), ginger (finely grated), spring onion (minced), shiitake mushroom (rehydrated from dry, then chopped), tofu (firm, crumbled), garlic (finely grated), and five spice powder. We also tossed the filling with some soy sauce and sesame oil; this is optional, but gave the vegetable filling more flavor and perhaps helped it to clump when wrapping. The meat dumplings contained the same filling with ground pork sausage flavored with five spice powder. We used the meat from two store-bought sausages (fresh, raw); any mildly-spiced, coarse sausage would likely work well, but ours were Italian sausage, often spiced with fennel or anise seed, which is commonly used to flavor Chinese foods too. We wrapped the filling using a simple dough of all-purpose flour and water, about 3 cups flour to about 1 1/4 cups water, rolled into balls and flattened by hand into circular wrappers. 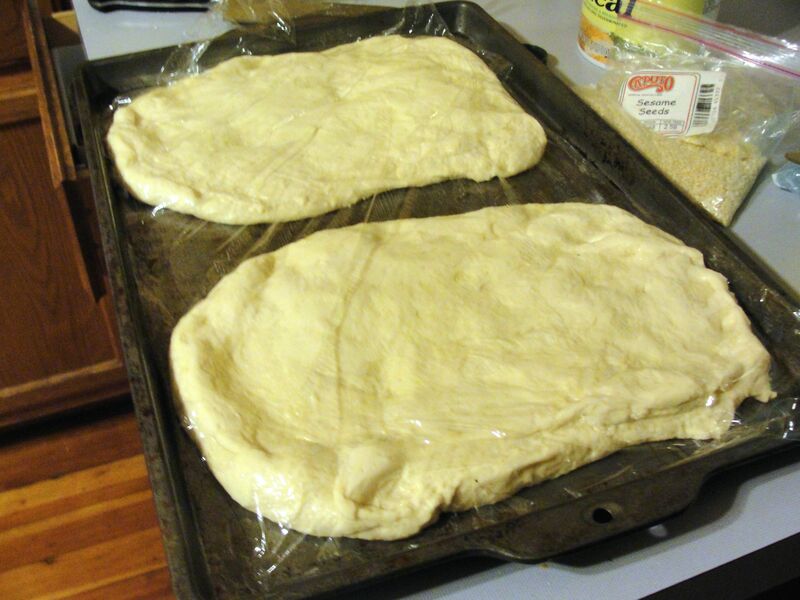 Fill each wrapper right after you flatten it to avoid the dough becoming too dry to work with. Place whole cabbage leaves in the bottom of a steamer tray to keep the dumplings from sticking. After steaming the dumplings for about 20 minutes total (15 minutes is probably sufficient for the vegetarian ones), we served them for dinner along with a miso soup and froze about half of them to steam another time. 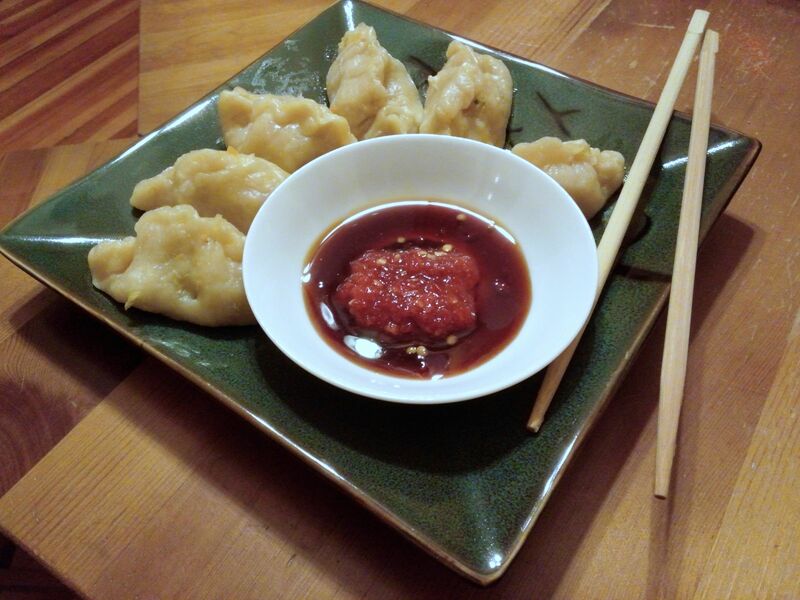 These dumplings were a fun project for two on a weekend evening and tasted every bit as good as many I’ve had at restaurants, even though this was a first time making them at home. Give them a try! Mirza ghasemi with Barbari bread. 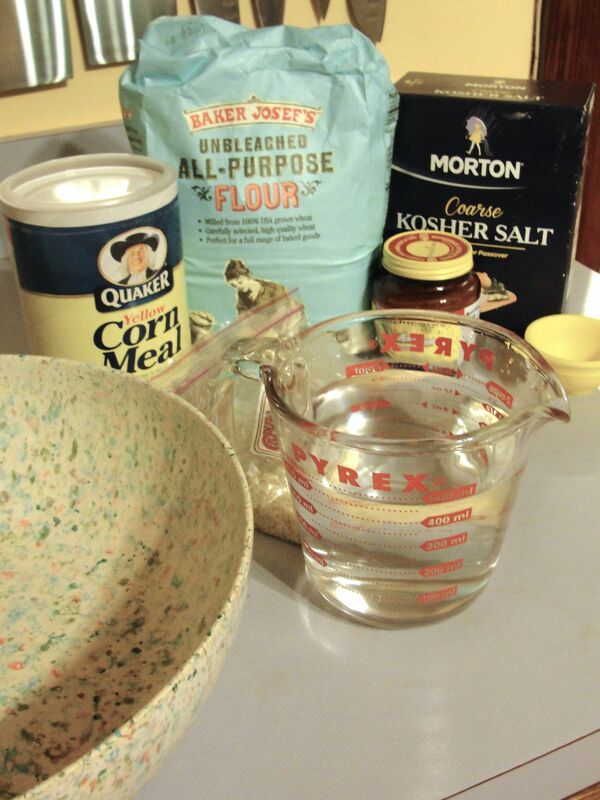 This is a special recipe for me and one that I’ve been meaning to make for 10 years or more. I was introduced to Iranian or Persian foods in the ’90s in Madison, Wisconsin at a wonderful restaurant called Caspian Cafe. The restaurant has been closed for some years, but its colorful co-owner and chef, Mohila Nateghi, has a web site here. She typically had a smile for guests and did a great job of pointing the neophyte to her best options on the menu that day, such as the crispy part of her lubia polow or her dill rice. 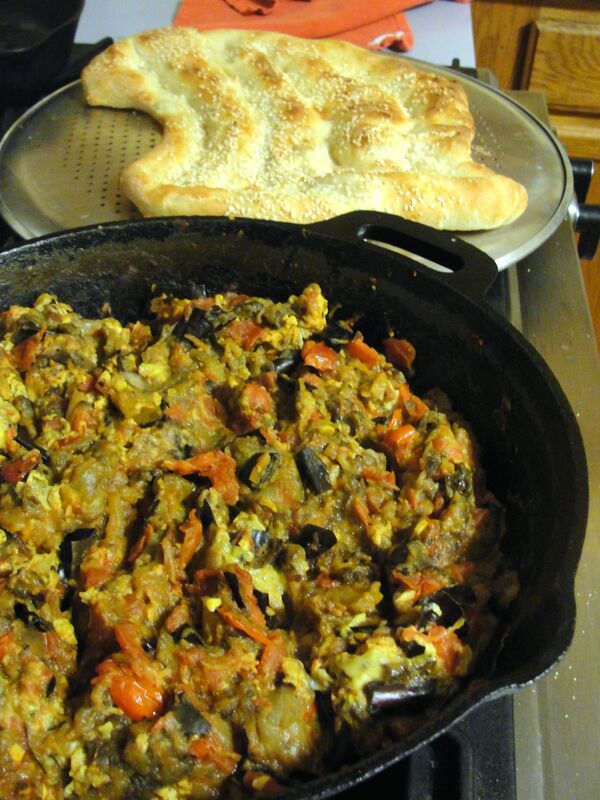 One of my favorites was, and is, mirza ghasemi, the wonderful dish of scrambled egg, eggplant, tomatoes, and garlic. Mohila’s version was absolutely loaded with garlic; whenever it was on the day’s lunch menu, I knew I would smell of garlic the rest of the workday, but that did not dissuade… it was so good. For preparation details, see detailed recipes linked below (at bottom of post). I used them roughly as is, except used a combination of canned and fresh tomato and added smoked paprika to the mirza ghasemi. 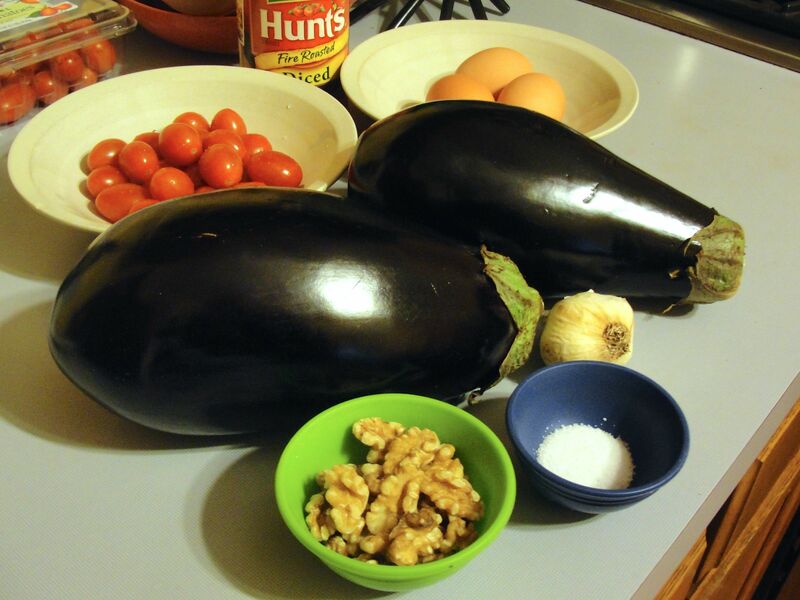 Unusually, I also chopped the roasted eggplant length-wise and and width-wise with a chef’s knife to cut their skin into pieces; while atypical to include the eggplant skin in the dish (rather than peeling it after roasting) I didn’t find the skin in any way objectionable since I roasted the eggplant in the oven rather than over open flame (which would then add an undesirable burnt flavor if the skin were included). The restaurant served all its entrees with a number of sides, one of which was a tasty flatbread that was likely a version of Tandoori or Barbari bread. 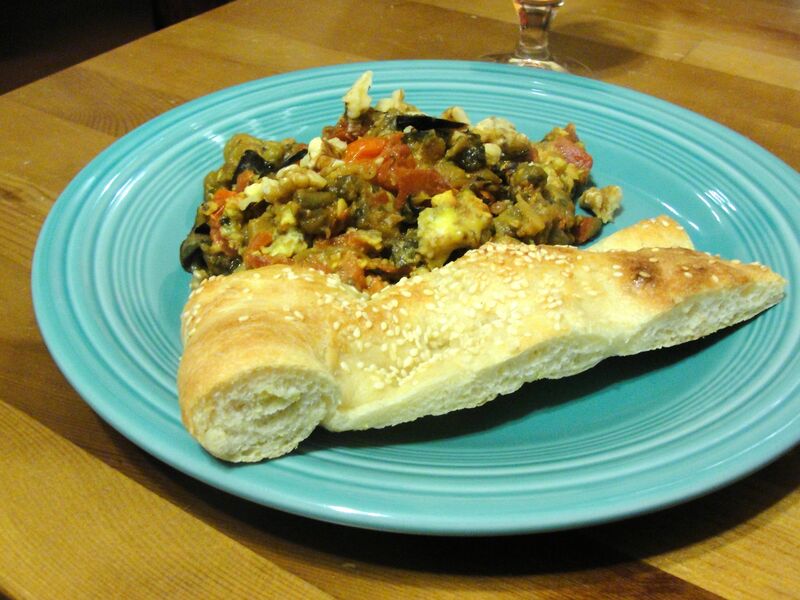 For this meal, paired with Barbari bread, one must start preparing the bread first… perhaps 4 hours in advance. 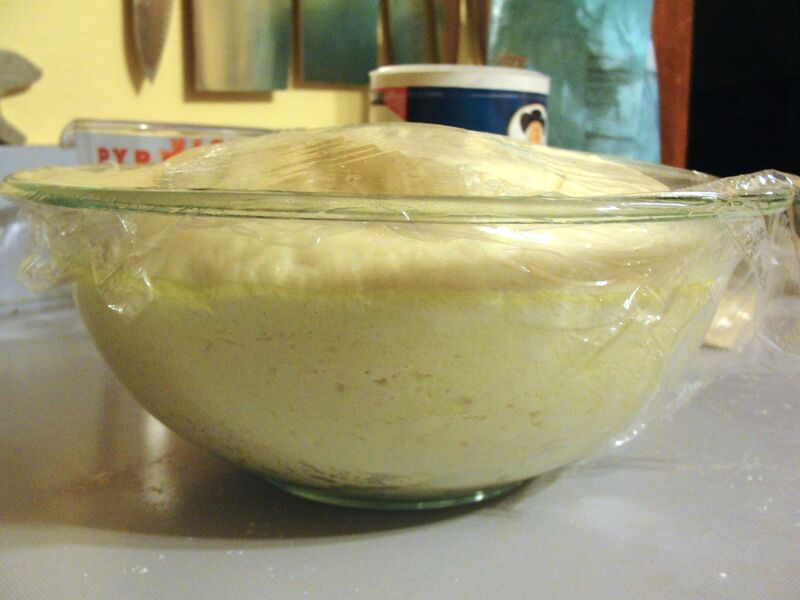 I made the bread dough and had it initially rise in the refrigerator for a couple hours. Barbari bread dough after initial rising. Barbari bread dough final rising for about an hour. 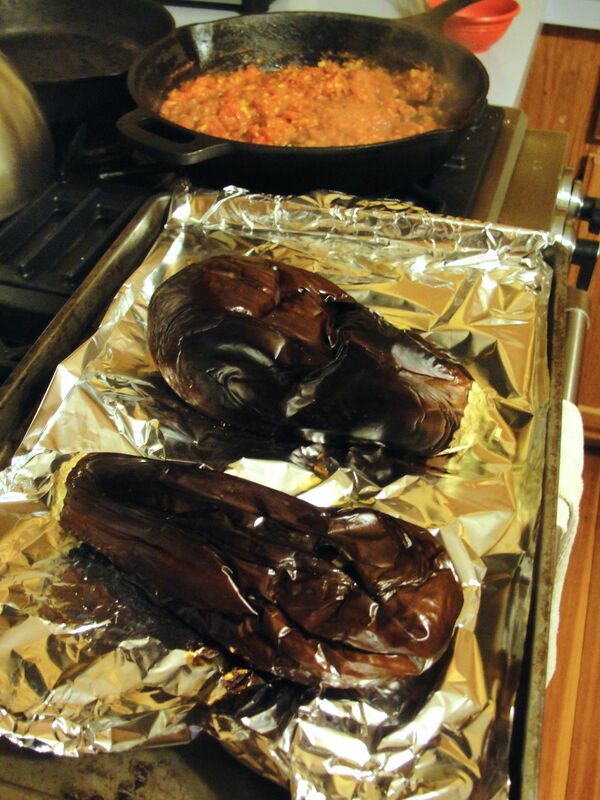 Having previously attempted to roast eggplant over the open flame of a gas stovetop and having it be undercooked, this time I decided to bake them in the oven (40 minutes at 425° F) and then finished under the broiler to just begin to blister, but not burn, the skin. 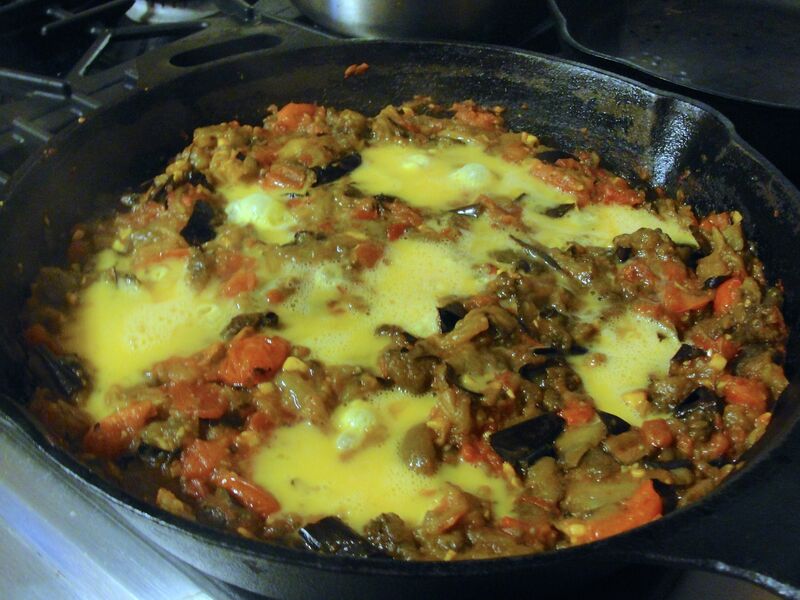 Near the end of the cooking on the stovetop, I poured beaten egg (3 large) into 6 holes in the eggplant, tomato mixture, and continued cooking until the egg solidified, then stirred and allowed to cool about 20 minutes before serving. The Barbari bread was topped with sesame seed and baked on a pre-heated pizza pan (500° F) for about 15 minutes, until it browned nicely. Mirza ghasemi and Barbari bread with sesame seed. I served the mirza ghasemi garnished with walnut pieces and accompanied by a piece of bread. 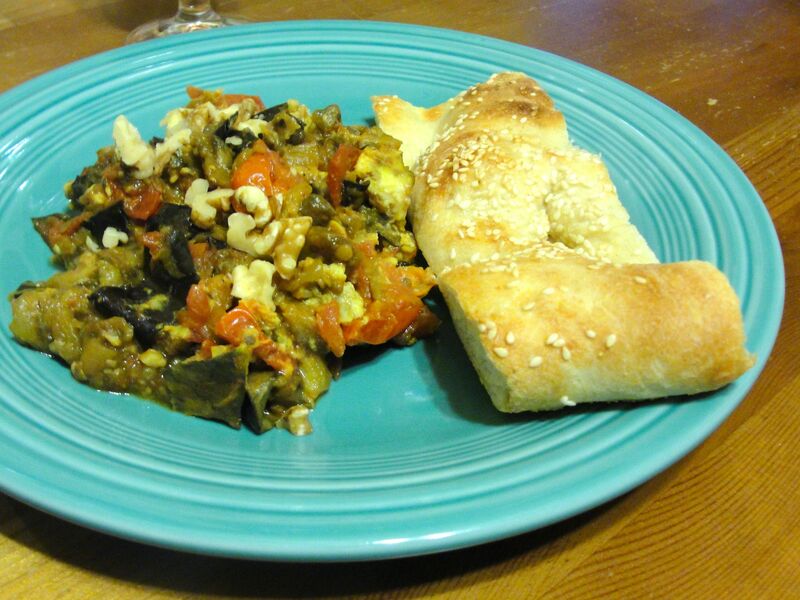 I really enjoyed this meal that reminds me both of my introduction to wonderful foods of the world and friends from far-off lands; I hope you enjoy it too!